Ok, Pixar. We get it. It is nearly impossible for you to make a movie that is average, or doesn’t tug at your heartstrings by the end. The latest in the “how is a cartoon making me cry” canon is COCO. 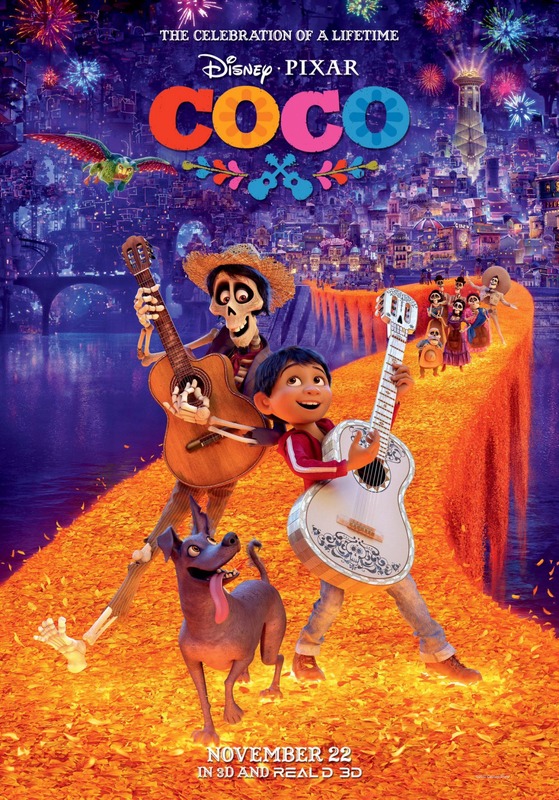 Rather than have me describe the plot, let’s go to IMDB: “Aspiring musician Miguel, confronted with his family’s ancestral ban on music, enters the Land of the Dead to find his great-great-grandfather, a legendary singer”. Yeah, that’s pretty much the basics. It’s a story about family, expectations and how following your heart means doing what you love even if it disappoints those who love you. The film as a whole is wonderful, but there were several parts that stood out for me. It is visually stunning. When Miguel first enters the Land of the Dead, the detail and color are breathtaking. The story embraces Mexican culture, but does not pander to it. That is a hat tip to Pixar for brining on writer and director Adrian Molina. It was his story and his co-direction with Lee Unkrich (TOY STORY 2 & 3, FINDING NEMO) is a marriage made in storytelling heaven. This isn’t a Mexican story with “gringo” music. Every song is an homage to the rich musical history of Mexico. The performances are simply fantastic. Like Auli’i Cravalho in MOANA last year, Anthony Gonzalez is the breakout star here. He does great voice work as Miguel and his singing is top notch. And because it is a Pixar movie, bring tissues. The last 15 minutes are sure to make you weep, or at least coax a tear to run down your cheek. Pixar has raised expectations with each movie. We count on their movies to tell compelling stories and tug at our heartstrings. When they don’t (CARS 2 &3, THE GOOD DINOSAUR) it is a major disappointment and begins wringing of hands. But then a movie like COCO comes along and we once again believe all is right in the Pixar universe.